Find a Great Alaska Job! Alaska is popular for many things: wilderness, beauty, vastness, nature, oil, fish, industry, culture, animals and so much more. So it makes sense that people from all over the world travel thousands of miles each year to visit the Last Frontier. Tourism in Alaska – from May through September – is when Alaska’s really hopping! So much so in fact that the number of things to do in Alaska during these months and the number of summer workers needed to facilitate incoming tourists is nothing less than immense. 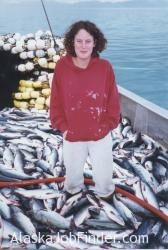 AlaskaJobFinder started out focusing information on jobs related to Alaska’s fishing industry. Since, it has expanded to offer job seekers a multitude of information expanding past Alaskan fishing jobs into the many summer tourism jobs that are available in abundance. These jobs are popular among college students on summer break, nature lovers and anyone else who wants a chance to make money and work in one of the United State’s most gorgeous wilderness locations. The number of jobs available during Alaska’s tourism boom, mainly in the months of May through September, are many and range extensively from fishing and related fish industry jobs to land tour operators for cruise lines to working in national parks or even acting as a hunting and fishing guide. While many of these jobs represent seasonal employment during the summer months many of them are available year round. In fact isn’t uncommon for people to begin a job focusing on Alaskan tourism and turn it into a lifetime career. Work in State and National Park Lodges – If the rough backcountry of the wilderness isn’t for you, try a job working at a lodge within Alaska’s many state and national parks. Even if the rougher side holds some appeal to you, there is work available at many more rustic and ‘activity based’ lodges as well. Its an amazing way to spend your summer earning tips as a waiter or waitress, assisting guests via customer service, cooking or cleaning or by becoming an excursion guide. Lodge jobs are some of the most popular because of the appeal of working in gorgeous national parks, working with people and the good money available for employees. Learn more about working at a lodge in Alaska. Alaskan Fishing Industry – When it comes to information regarding the Alaskan fishing industry, AlaskanJobFinder takes the cake. This was the initial focus of the website when it was first started. As such, members learn tons of information regarding how to get a job as a deckhand on a fishing boat. Think about making excellent income in just a short time by fishing the wild waters of Alaska! There are hundreds of jobs in the fishing industry and AlaskaJobFinder is the perfect place to learn all there is to know about this popular and exciting job. Learn more about working in the Alaska fishing industry. Fish Processing and Canneries – Jobs as a fish processor in Alaska is the perfect territory for new comers in the Alaskan fishing industry. Because deckhand jobs are so popular many people start off making excellent pay by processing the fish that comes off the Alaskan fishing boats. These jobs are excellent segues into deckhand and even sometimes crabbing jobs. The hours are long but the scenery gorgeous and the camaraderie you feel among others is an enormous perk. The hefty paychecks don’t hurt either. Learn more about Alaska fishing processor jobs. Tour Operators – Being an adventure tour operator is the perfect job for the rugged outdoorsmen or athletic nature lover. With so many tourists pouring into the Alaskan wilderness there is a high demand for guides to lead mountain biking excursions, hikes, organize sporting events and lead backpacking trips. These jobs can be difficult to procure because for many, it represents quite possibly the perfect job – thus, they go quickly. Learn more about working for a tour operator in Alaska. Cruise Ship Industry – There are hundreds of cruise ships in Alaskan waters each summer and more and more people each year are getting onboard for an Alaskan cruise. Many cruise jobs are seasonal and the pay is excellent. Anything within the realm of hospitality is fair game when you work for a cruise line – large or small – and is a great way to save money and travel at the same time. Cooks, cleaners, waiters, bartenders, entertainers, luggage handlers and more are just a few of the jobs advertised in our Job Center. Learn more about working on a cruise ship in Alaska. Land Tour Industry – With so many cruises making their way north into Alaska there is a high demand for tour guides to lead on-land excursions when cruise ships dock on the Alaskan coast. This means guides are in high demand to drive vans, lead groups to bear watching points, salmon bakes and to assist in the transport of cruise goers to and from the ship. Learn more about working as a tour guide in Alaska. Rafting Operators – People come into Alaska looking for adventure and nothing says adventure quite as well as tackling Alaskan rapids. While these jobs usually go to trained professionals many companies are willing to train new comers who are eager to learn. The highest standards of safety are required in any Alaskan wilderness job and this certainly goes for raft guides. It might take some time to become certified but rafting the Alaskan wilderness summer after summer and getting paid for it, is hard to beat. Jobs organizing schedules, working in a tour office and being a guide yourself and are just a few of the available jobs for rafting operators. Hunting and Fishing Guides – Hunting and fishing in Alaska is on the top of any outdoorsman’s list of things to do. As such, there is a demand for hunting and fishing guides who are skilled and experienced to lead hunters and fishers to good hunting grounds and to help everyone abide by Alaska’s strict rules and regulations. Hunting and fishing guides are among the lucky few who have turned their life passion into their life’s work. Others find work as a cook for hunting camps and bases and others run hunting and fishing supply stores scattered throughout operating camps as well. If you can imagine yourself working in Denali National Park, in the foreground of snow peaked mountains, nearby glacier towns, salmon streams and some of the most beautiful scenery in the United States, then a summer job in Alaska could be the perfect job for you. 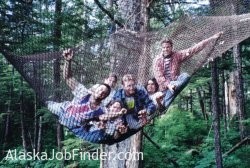 AlaskaJobFinder is the single largest resource of jobs available in Alaska for summer, seasonal and year round employment. Our member’s section is constantly updated with information regarding new jobs that are available within Alaska. With hundreds of employer profiles, job listings, job boards and information regarding how to get and apply for these jobs, AlaskaJobFinder is the perfect resource for landing the perfect Alaska summer job. As new jobs become available, job postings are updated through our Job Center. This makes finding a job easy because all pertinent job and employer information can be found in just one location. 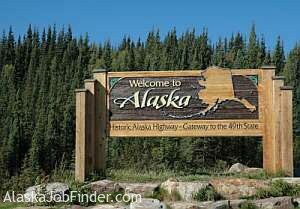 It has all the information you need to know about your future employment in Alaska. Use AlaskaJobFinder to help your find your dream job. There are hundreds of open jobs right now. Simply click the button below to start your job search. Watch this short Video Tour of our Member's Section. Post Jobs, Search Resumes, Build a Company Profile! Copyright 2001-2019 -- M&L Research, Inc. -- All rights reserved.